Pictured, from left, are Harry Snyder, president/CEO of Great Oaks Career Campuses; Kelly Keeton; Tom Wheeler, Great Oaks director of special education. Kelly Keeton, CareerX instructor at Laurel Oaks Career Campus, was honored by her peers recently as a Franklin B. Walter Outstanding Educator for her work with students with disabilities. Keeton, a Greenfield resident, was presented the award by the Ohio Region 14/Hopewell Center, serving school districts and families of Adams, Brown, Clinton, Fayette and Highland counties. 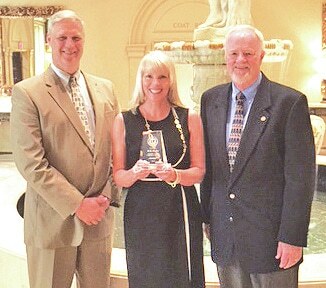 The award was presented at a state ceremony on June 17. Keeton’s efforts this year have made the CareerX lab a focal point on the Laurel Oaks campus. New to Great Oaks this year, she has worked in special education for many years in several area districts and has relationships in the various communities served by Laurel Oaks that helps in preparing students for the adult workforce. Keeton effectively uses the Practical Assessment Exploration System to teach students not only required work skills, but also the persistence needed to be a quality employee. She is unwavering in her expectations for her students and has found business partners that share that vision. The Career X lab is an integral part of the daily routines at the Laurel campus. The students run the recycling program, assist with the supplemental food backpack program and are active in community service initiatives. Keeton’s ability to build solid relationships with business partners are paying huge dividends for the students. Among those business partners are Holiday Inn, Home Depot, Lowe’s and Sabina Industries and they fully integrate our Career X students into their training programs. The Franklin B. Walter Outstanding Educator Award is presented to one educator or team from each of Ohio’s 16 State Support Team regions who have made extraordinary contributions to the education of students with disabilities. Submitted by Jon Weidlich, community relations director, Great Oaks Career campuses.